It was unsurprising to see large periods of the match situated in Tottenham build-up against the pressure of the hosts. The ball was passed between the white back four as they patiently looked to find an opening against the well-drilled defensive block. The pairing of Hernandez and Kießling covered Wanyama, who was acting as the lone pivot, with their shadows. Charles Aranguiz was oriented towards Christian Eriksen, who was making momentary dropping movements down the left half-space of Bayer’s defence. Their 4-2-2-2 shape as ever covered the centre of the pitch from half-space to half-space, shifting quickly to maintain access and block passes through the middle. Against Bayer Leverkusen, teams are forced to play against the press and find a way through the inevitable pressure. Pochettino’s side chose to try and pass through it. Jan Vertonghen and Eric Dier both were purveyors of vertical passes into the midfield. Possessing a sound passing range, the centre-backs were potentially useful tools in breaking the pressure through direct and line-breaking distribution. Kampl’s blind-side was particularly targeted by these passes, where Dele Alli was always lurking to receive in space. Both full-backs stayed deep during the build-up of Pochettino’s side. While also providing a degree of security against any Bayer counter-attacks, this could’ve been a tactic to create space in the Bayer press. Spurs’ coach will undoubtedly have known of the opposition’s threat when the ball is played to the full-back, after all, the same can be said for his own side. Bayer’s pass-map. Note the compactness of the midfield and vertical links. When they were passed to, it was unusual to see Rose or Trippier take more than two to three touches as they moved the ball on quickly, cautious of what little time they had. They worked to not get caught out by the pressing of their hosts, and although they couldn’t always escape the pressure, it was effective in reducing the risk involved. Through their positioning however, they could sometimes draw out the ball-near Leverkusen 10, which would then create space in the channel within Bayer’s block. An example of this occurred in the 17th minute, where Alli found space behind Kampl as Mehmedi was anticipating a pass to Rose. Bender was forced inside to pressure the free man and knowing this, Alli could play a clever flick to the then-free Son to attack down the flank. Another way of breaking through was often direct passes to the wings. The aggressiveness of Leverkusen’s full-backs meant that their space was vacated at times during Spurs’ build-up. It often took a long diagonal from a centre-back, towards a winger or a full-back making a third-man run to bypass the midfield. However, in these cases, the pass was often hard to make accurate, and even then hard to control while the shifting of Leverkusen helped to stop many chances from forming. As the match developed, Spurs became increasingly direct in their attempts to counteract the Bayer press. Leverkusen began to move out of their mid-block more with the intention of forcing turnovers within the opponents’ third. Therefore, Janssen was the recipient of more long passes from the centre-backs, as the midfield was becoming slightly too hectic to play through. With both coaches being advocates of intense-pressing games, the centre of the pitch was as hectic as one would expect. Both teams were applying great amounts of pressure on the ball with two compact structures both in and out of possession. Due to the aggressiveness of either press, neither team could afford to lose access in these moments for the risk of being caught open deeper. Therefore, both midfields were working to restrict the vertical play of the opponents’. The result wasn’t pretty at times. There were a number of ‘scrappy’ interchanges of possession where both sides had pressure on the ball for the entire duration. Intentional fouls were commonplace for the above cause and Spurs found it difficult to play with the same flowing football which cuts the ever-so–slightly less compact Premier League defences open. However, that isn’t to say that they couldn’t entirely. The visitors even used their intricate passing interplays to counteract Bayer’s pressure. Through circulating the ball at a fast pace, they were able to develop a level of pressing-resistance and thus play through defensive pressure. In some cases, Pochettino’s side even invited the pressure, to then play straight through the waves of defenders through their fast combinations. Despite breaking through Bayer’s initial press, Spurs weren’t able to fashion many chances at all. The biggest opportunity on Leno’s goal came in the form of an open shot just in front of the 6-yard box. The problem being that it was a header, and the player in question was Dele Alli. Both Tah and Toprak defended very well when needed, whilst Bayer recovered well if their press was broken through. The centre-backs’ defending in one-on-one situations was particularly admirable as they both tackled cleanly when their attacker was in motion. In the centre, Kampl and Aranguiz are extremely dynamic players who are capable of covering a large amount of space. While Bayer’s possession game is more direct and vertical than their visitors, the pressing of Pochettino’s side was important in limiting the threat. By closing down the opposition deep into the black and red territory, Leverkusen were forced to start their vertical plays from a deeper area of the pitch. Not only did this mean that their initial attacks would be less threatening, but the resulting counterpress was less of a problem too. Pressing in transition is a crucial part of Schmidt’s attacking game, as it allows Bayer an opportunity to regain the ball in high areas whilst the opponents are disorganised and potentially making counter-attacking runs. However, due to their direct balls being made further away from Lloris’ goal, these moments were less dangerous for Spurs. The counterpress was more often situated in the midfield zone, which Tottenham could match with pressure of their own to create a less-threatening situation. While Tottenham looked of some threat in the first 45 minutes, the match was quite literally one-sided after the interval; Pochettino’s side wouldn’t take another shot. Baumgartlinger was introduced to further reinforce the midfield at the expense of Calhanoglu, whose position was taken over by the versatile Kampl. The former Mainzer’s presence helped to increase their defensive stability in the midfield pressing whilst Kampl’s defensive output is greater than his Turkish teammate. 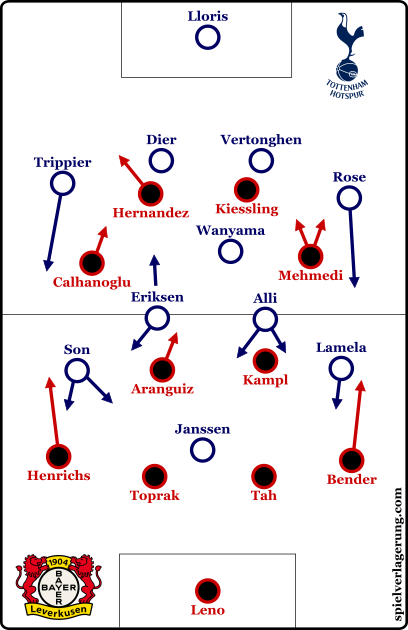 Leverkusen’s pressing continued in the same fashion, and with Kampl in a higher position they were able to better restrict Spurs’ build-up. A territorial advantage began to develop with more of the ball staying inside the half defended by Vertonghen and co. 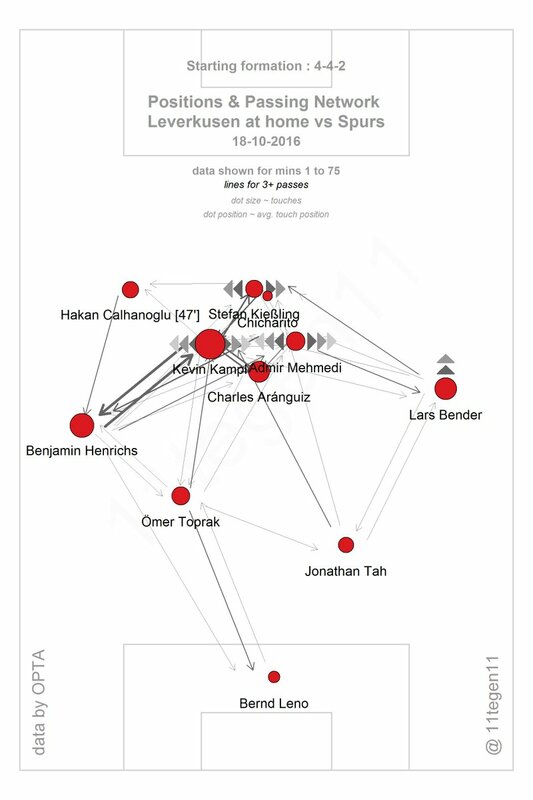 Through a higher attacking position, Leverkusen’s play was overall more threatening but their counterpressing was able to provide more benefit. While it was opened once or twice by a Tottenham counter-attack, it worked more to sustain Bayer pressure. Said pressure forced Tottenham into a deeper defensive position from which they struggled to press themselves. With less pressure in build-up, Schmidt’s side could initiate their attacks from a position higher up the pitch which showed in the share of attempts in the second half. With their pressure came a number of chances, yet they were unable to convert them and Tottenham came out with a somewhat lucky point. 11Tegen11’s expected goals perspective on the game. Although the scoreline may suggest otherwise, this was an exciting match between two teams with clear and sound strategies. Spurs were able to break through their host’s press on a couple of occasions yet not consistently enough to form a real threat. Schmidt’s intelligent substitution helped to reinforce Bayer’s pressing game, and they were able to create a better share of the chances in the second half. Would you agree the addition of Baumgartlinger and putting Kampl out wide opened up the field creating better width in their possession which help create better scoring opportunities? Hey TP, do you think that the best pressing system like for example the Bielsa one or the Pochettino one could be beaten by collective dynamics,positionings etc, or do you think that there is a pressing system that is so effective that just by individual pressing resistance is beaten? Playing Kampl as the left of two 10ers might be a solution to Leverkusen’s problem of attacking through the 10 space. Calhanoglu is a very gifted and talented midfielder, but he loses his head when pressured while Kampl always keeps his head up and does find profund ways to keep the attack going, sometimes even when taken on by two. Because of that decent 2nd half, we may see KK44 also against Hoffenheim playing the offensive midfielder. Stability is what Neverkusen urgently needs as long as their attacking does not work as well as in april 2016. Thank you for that good analysis, TP.